I have a ton of Halloween and fall stuff to swatch right now. BUT.... Whimsical Ideas by Pam Hatched has been sitting in my untrieds for weeks now, and I just couldn't bear to leave it there until the proper season. I like to call any pastel yellow "baby chicken yellow" and Hatched is definitely a very sweet baby chicken yellow with pinky purple, green and blue glitter. I LOVE this polish so much, I can't wait to wear it in the spring. I think it'll be my first real spring mani. This is three coats of Hatched all by itself. 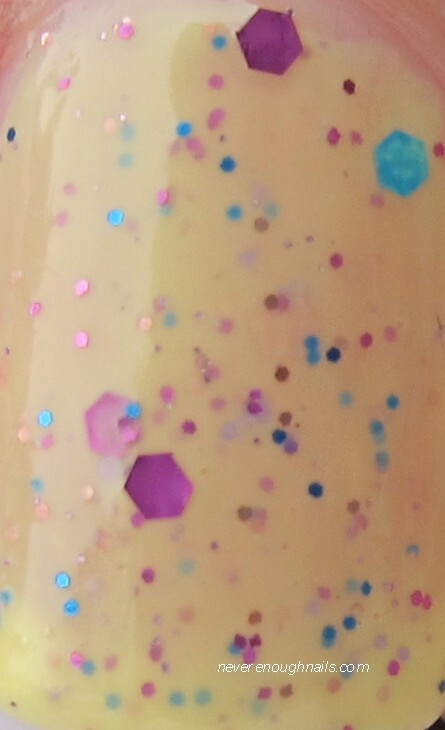 I think a fourth coat would eliminate any VNL, but you could also layer this over a pale yellow creme, like China Glaze Lemon Fizz, to increase the yellow-ness and also the opacity of the polish. Application was a piece of cake. The polish itself was not at all streaky (we all know yellows and their streaks!) and the glitter came out with no extra prodding. This was only my second Whimsical Ideas by Pam polish, and I definitely want more! For information about ordering Whimsical Ideas polishes, check out their Facebook page. They have a Halloween collection available now too!!! This is ADORABLE. just simply precious!